The iconic statue that stands in front of Centennial Hall reminds the community that we stand on the shoulders of giants. St. Mark’s thrives today because of the forethought and dedication of generations of leaders beginning with Menter B. Terrill in 1906. Those visionary leaders established the School’s strong foundation, which affords today’s Marksmen the opportunity for an exceptional educational experience. The Path to Manhood statue also symbolizes our obligation to provide care and continued excellence to future Marksmen. Each year, parents, alumni, Trustees, and friends dedicate their time, talent, and resources, often to benefit Marksmen and others whom they will never know. The entire community shares the responsibility for ensuring that St. Mark’s continues to thrive for generations to come. A. Grow the School’s assets and resources while continuing to support the School’s existing and future programmatic, personnel, and facility needs. Continue to manage the School’s endowment with a view to maintaining the real purchasing power of the Endowment Fund with a reasonable level of risk. Continue to strive to have the St. Mark’s Fund support at least ten percent of the School’s annual operating budget. Emphasize operational efficiency and effectiveness, while maintaining the School’s commitment to excellence. Significantly increase planned giving as part of the School’s advancement program. B. In order to achieve the goals described herein, organize, launch, and complete a successful capital campaign to grow the School’s endowment by at least fifty percent above current levels. Define a comprehensive list of needs to address programmatic goals and opportunities. Maximize the impact of philanthropy by engaging a broader group of donors across the St. Mark’s community. C. Expand parent and alumni engagement programs. Expand communication to parents, alumni, donors, and other friends of the School. Expand engagement opportunities that strengthen affiliations with St. Mark’s. D. Maximize the effectiveness of the Board of Trustees. Increase the involvement of Trustees in a broader range of activities, including long-term planning. Expand orientation programs designed to integrate and prepare new Trustees. Review governance practices, with specific attention to meeting schedules, discussion format, service terms, and leadership succession. Working behind the scenes on every major decision that affects St. Mark's is a core team of more than 50 individuals who collectively dedicate thousands of hours to the School. They are alumni and parents; they are community leaders. Board of Trustees members serve across nine committees, investing each of their strengths to ensure the continued strength of every aspect of the School including financials, development, facilities, academics, and more. "I am continually amazed and humbled by the talented, dedicated people who serve as Trustees at St. Mark’s," said Jon Mosle ’79, President of the Board of Trustees. 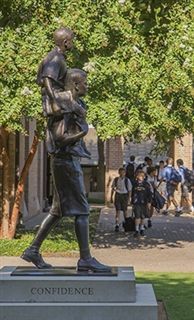 "This diverse group of parents, past parents, and alumni brings deep expertise across a wide range of fields, but even more important is their shared passion for St. Mark’s. On practically any day, Trustees are at the School, hands-on and engaged, doing whatever they can to help St. Mark’s achieve its mission."